4. Take your time with the crafting and equipment systems. The best way to ease yourself into the crafting system is to pick a weapon you've used regularly, and then upgrade it in bursts. By the end of the tutorial, once you've started to do a few missions, you'll have enough to upgrade your weapon into a better form, which is the best way to to get the most out of your weapons. Don't worry about wasting resources early on, because crafting your first weapons and armor out of Great Jaggi and Royal Ludroth parts isn't going to use anything you can't easily replace. The difference between the early weapons and their ever-so-slightly upgraded counterparts is huge in terms of sharpness and damage. The same goes for armor, try to concentrate early on getting a whole suit of something like Jaggi Armor or Mail - or Hunter's Mail - for the bonuses. Once you've hunted for a while, identify your next step up and focus on getting it in a huge burst - just farm that one creature until you've got the set. Keeping up your weapons and armor is hugely important, but it's not worth losing sleep over, as you'll naturally identify what you're able to craft just by playing for a while. Do remember that if you're a swordsman or gunner your armor isn't useful while using the opposite type of weapon, so don't craft upper tier swordsman or gunner armor until you're sure what weapon you want to use. Easing yourself into the item system, with its hundreds of components, potions, stones, traps, and bombs, will be easier than the weapons system. You can afford to learn a lot of these items later in the game, because the guild item box will be packed with stuff to serve as hints on strategy for each monster. For example, if the quest gives you a sonic bomb, then the monster likely has a weak point or attack that can be disrupted by loud noises. The nice part about these items is that they're completely free, giving you a chance to test out bombs and traps with no risk. Once you've identified the combinations that lead to these bombs, you'll be able to employ them in free hunt - or in difficult quests, safe in the knowledge that you didn't risk anything to learn to use them. 5. Watch the monsters and learn from them. Every monster in the game has attack and behavior patterns - you have to remember that any individual mission in this game is a lot like a boss fight in any other game. Additionally, most enemies have behaviors, like dragging their feet and drooling, that let you know when they're about to give up and flee. You'll fight each individual monster several times over the course of the game, and you'll want to know how to take them down efficiently. Learning a monster's attack pattern, for example, will let you know when their weak points are going to be vulnerable, or when their elemental attack is about to pop up. Once you know an enemy's attack pattern, you'll know when they break it and start to frenzy or panic, letting you know that they're close to death and it's time to lay your trap. 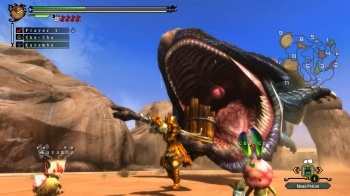 As you get into the game's more advanced techniques, like destroying different parts of your opponent, knowing how a monster moves will let you know when a tail will be vulnerable to cutting, or a crest available for smashing. A hammer user, for example, will quickly note when a Great Jaggi presents its head low to the ground - all the better to stun it with a head shot and knock its crest off. While all of these basics won't make you an expert, it's enough to get you started on your Monster Hunter 3 Ultimate strategy. Everyone has their personal play style, and most people will use their bombs, traps, and buffs differently. You'll develop your own, so don't overwhelm yourself with information in your first hours of the game. If you've got something useful to share, advice on a particular weapon style, or a must-use item, offer suggestions in the comments.